One of only 1,178 built! Only driven 1,676 miles since restoration! 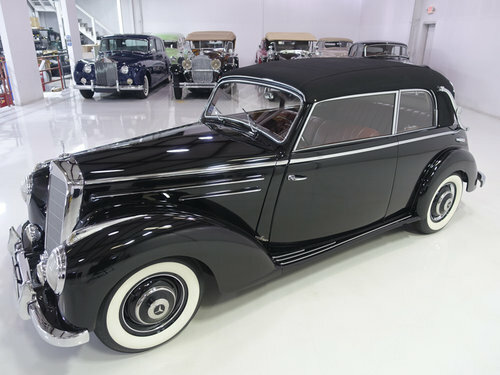 Excellent documentation includes owner’s manual, parts book, build sheet copy, original Mercedes-Benz 220 brochure, tool kit, over $90,000 in restoration invoice copies, restoration photos and more! 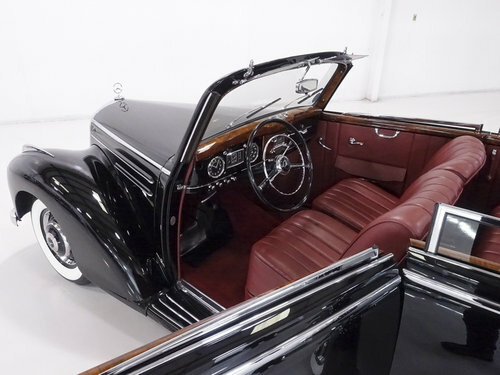 The 1952 Mercedes-Benz 220 Cabriolet B featured here is finished in stunning black over a wonderful red leather interior and magnificent wood trim throughout. This particular example was dispatched from the Sindelfingen factory on June 19th, 1952, and was sold new in Europe. It underwent a complete body-off-frame, full nut and bolt restoration by the notable Arizona-based restorer Barry Briskman of Automobiles Water Here and is fully documented with restoration receipts as well as a selection of restoration photos which document the meticulous amount of care that brought this Mercedes-Benz back to like new standards. 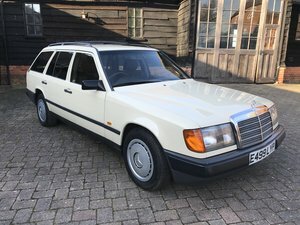 Reputedly having two owners since the restoration, this classic Mercedes-Benz presents in show worthy condition with excellent trim and woodwork throughout. 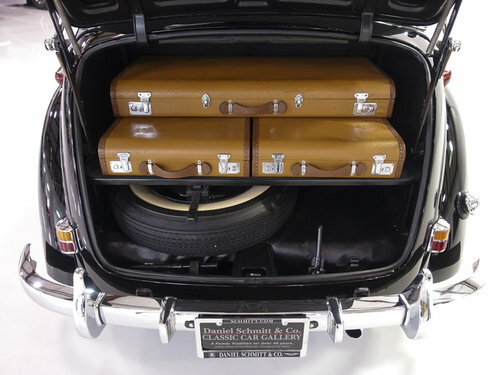 It is accompanied with its owner’s manual, parts book, tool kit, jack, fitted luggage in the trunk and more. 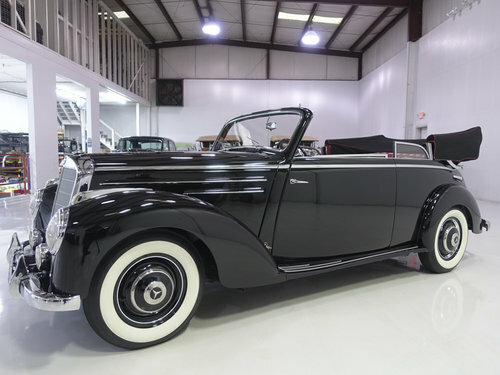 We are proud to offer this 1952 Mercedes-Benz Cabriolet B to the most astute collector, investor or enthusiast who appreciates the spectacular hand-built quality of these classic German luxury motorcars. Ready to make an investment that you can actually enjoy? Classic cars have proven to be among the most resilient and rewarding investments in recent years with the Historic Automobile Group Index (HAGI) jumping 39% in 2013, 16% in 2014 and 17% in 2015 while posting gains of 467% over the last 10 years. Please contact one of our expert sales consultants at (314)291-7000 or [email protected] for more information. They will be happy to give you a complete walk-around, supply you with a more detailed description and answer any questions you may have. Buy with confidence. As one of the first post-war Mercedes-Benz models, the 220 was introduced at the Frankfurt Auto Show in April 1951. 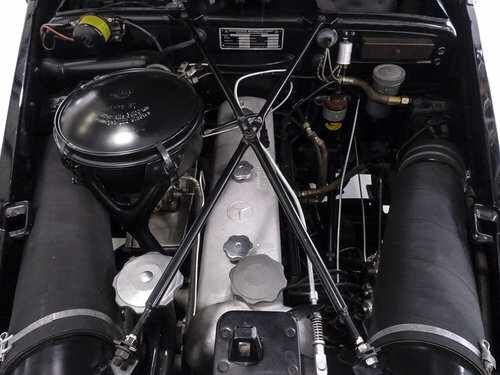 The 220 featured the return of the inline 6-cylinder engine, which displaced 2.2 liters (hence the 220 nomenclature) and provided an ample 80 horsepower. Styling was similar to the pre-war 170 though the headlamps were now fully enclosed by the front fenders. 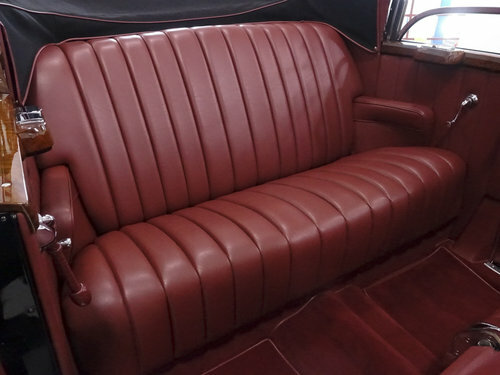 The modern front end was longer and interior furnishings were more lavish. The overhead camshaft inline-6 was mated to a column shifted synchronized 4-speed manual transmission which did provide (and still does today) a lively driving experience. Top speed was nearly 90 miles an hour and it could reach 60 miles per hour in 20 seconds from a full stop. 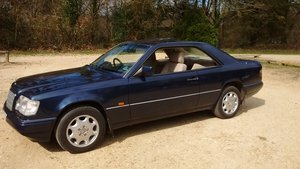 The 220 was offered in two different cabriolet options, the sporty Cabriolet A and the stylish Cabriolet B which offered comfortable seating for four. With undeniable style and ample performance, the 220 marked Mercedes-Benz’s return to form after World War II by offering luxury for the whole family while providing the level of performance that resonates in the spirit of Mercedes-Benz today – the best or nothing. Please visit http://www.schmitt.com to view our full inventory. An immaculate low mileage, high specification example. Mileage is warranted with previous MOTs and Service Book to Confirm. Recently refurbished alloys. Superb Value.